"Tangkap orang pembangkang, MACC dikata macam-macam. Tangkap orang BN, pun kena juga. We have no friends and it is OK."
In Umno, a divisional chief is a big deal. There are only 191 divisional chiefs nationawide. PM Najib Razak is the chief of Pekan division. DPM Zahid Hamidi is divisional chief of Bagan Datoh. So just because you may not have heard of Rizalman Mokhtar before his Vegas arrest does not make him a small fry. In his own words, "saya ada 82 cawangan, saya ada 19,700 ahli, and as for now semua ada di belakang saya .. dan semalam saya mendapat 100 peratus sokongan daripada Jawatankuasa Umno Bahagian dan juga ketua-ketua cawangan". But neither is his current predicament. His testing positive in a drug test following his arrest at a ktv joint like Vegas is not an "isu kecik" (small issue). Rizalman has to understand that. He must also accept that even if he gets to clear his name, prove that his Nescafe had been laced, and that it was indeed a political sabotage and character assassination, the damage is done. And the press conference didn't really help his cause, if you ask me. 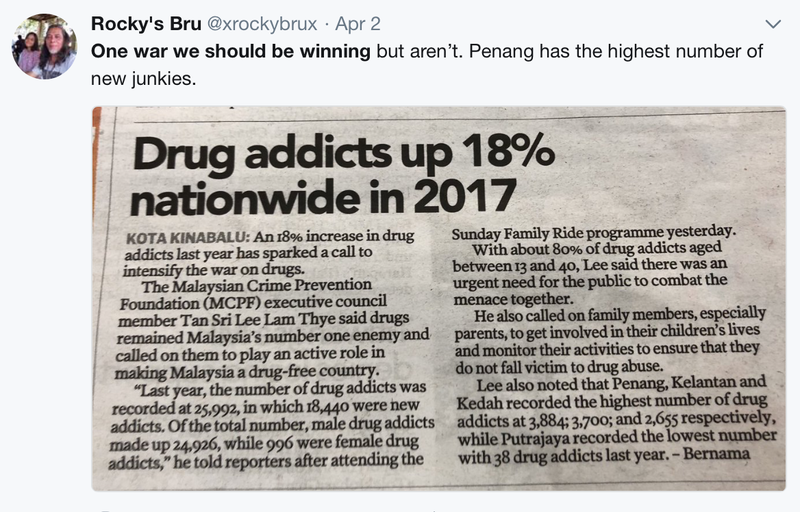 Penang, Kelantan and Kedah are losing the war badly. We shouldn't politicise the issue but it so happens that Penang and Kelantan are ruled by DAP and PAS, respectively. And Kedah, well, I shouldn't say anything .. Since when you have becoming an UMNo's barua ? 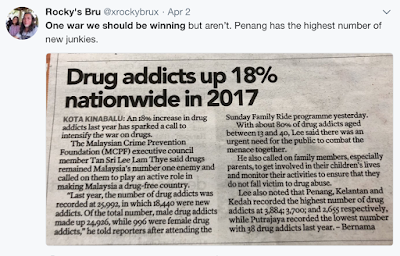 "Penang, Kelantan and Kedah are losing the war badly. We shouldn't politicise the issue but it so happens that Penang and Kelantan are ruled by DAP and PAS, respectively. And Kedah, well, I shouldn't say anything." You are truly a sad and desperate creature. This is what the matsals call "grasping at straws", kan? Anyway, the KBU of the ROS just did her bit to ensure that your beloved First Klepet can continue to rob Malaysians blind for the next 5 years. Here's hoping that the sell-out "paid professionals" get a good dedak refill thereby. DADAH DALAM AIR KENCING, ISSUE KECIK KE.............????? Tu lah, sapa suruh awak usrah di DE VEGAS. Pertama kali rocky's bru bercakap secara realiti. Apapun kadangkala ia boleh jadi small matter bergantung kepada endorsement big boss. Zahid dan ku nan belum cukup big.